Your basic training collar will be a buckle or quick-snap collar. Every dog should have one. You will attach any tags and identification. This is the only collar that is safe to leave on your dog when he is alone. Try to do as much of your training as possible on this collar. A disadvantage of buckle collars is that some dogs can back out of them. This is dangerous if you are walking on a street. For this situation, I recommend a martingale type collar. A popular brand is a Premier collar. This type of collar closes enough to prevent your dog from escaping, but not enough to choke your dog. When it comes to teaching your dog not to pull on leash, you may find it useful to use something other than a buckle collar. 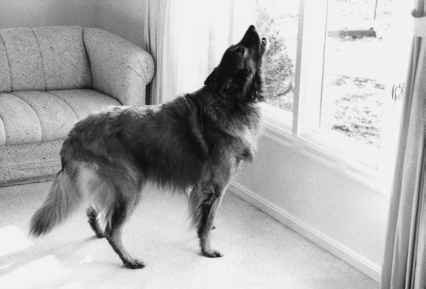 There are several to choose from, all of which work by making your dog uncomfortable when he pulls. My favorite is a head collar. Some popular brands are the Gentle Leader and Halti. Head collars work by pulling a dog's head to the side when he pulls forward. These are very humane and the most effective way to stop pulling on leash. 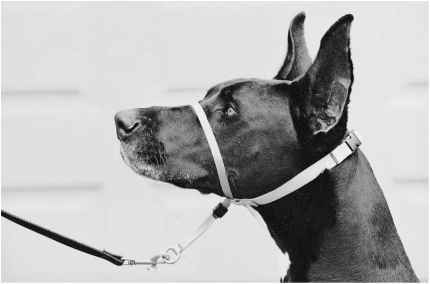 Head collars have a strap that goes around a dog's neck and another that goes around his muzzle. They work like a halter does on a horse. If a halter can control a thousand-pound animal, it can control the largest Newfoundland, the most headstrong Lab, or the most stubborn terrier. Head collars are great for working with dogs who lunge for any reason, whether to jump on people or chase squirrels, or because of aggression problems. They can make trips to the vet much less stressful. Prong collar, nylon choke collar, buckle collar, martingale collar. The main disadvantage of the head collar is that it can be hard for a dog to adjust to having something on his face. Dogs sometimes paw at their faces initially, trying to get the head collar off. They may even throw themselves on the ground. Most dogs, however, adjust quickly, especially with treats to help. Sometimes the dogs who need it the most object to it the most, so give it a chance. I love seeing the smile on an owner's face at the instantaneous and miraculous cure for a dog's pulling problem. The other disadvantage of head collars is that other people may think your dog is wearing a muzzle and is aggressive, although this is becoming less of a problem as the popularity of head collars increases. A dog can eat, drink, and even bite with it on. One caution: do not use head collars with a long line or retractable leash. A dog could hit the end of a long leash with too much speed and hurt his neck. When using a head collar, it is very important to release all tension on the leash the instant your dog stops pulling. That is your dog's reward. Don't keep constant tension on the leash. This can be a hard habit for you to break if you have had to keep a death grip on your leash to hold your dog. If your dog continues to dislike the head collar, it is probably because you are keeping it tight all the time.